There are some plants that are not so widely grown, but that deserve much more interest from gardeners. Perhaps they are less showy than some of the most flamboyant, colorful plants, but they often have great charm and lovely features, once you get to know them. One of these groups is the Osmanthus Bushes, often called ‘tea olive’, or ‘false holly’. They are remarkable evergreen bushes or sometimes small trees. Extremely worthwhile plants, they should be in every garden where they can be grown. They are easy to grow, mainly restricted by temperature, rather than soil or shade, so if you live in Zone 7 or warmer, they are very easy, and very worthwhile. The main feature of Osmanthus Bushes is their fragrance – they bring a remarkable sweet scent to the garden for weeks, in fall, a time when not much is happening in the rest of the garden. Although the species that are most important in gardens bloom in fall, there are others that bloom in spring. By planting both kinds, you can have blooms for half the year. The attractive flowers are almost always white, and while not large, they make up in aroma-power what they lack in size. Often describes as smelling of peaches, Jasmin, and orange blossom, their scent will penetrate the whole garden, and drift into the house if you plant beneath windows. The remarkable perfume of these plants is sought after by perfume makers all over the world, and features in several luxury brands. Flower is not all there is to these bushes, because their foliage and form is also attractive. The rich-green glossy leaves are evergreen, with a smooth surface. Sometimes the edges have tiny teeth along them, or they may be spiny, like holly leaves. Some forms have attractive mottled foliage, which adds to the plant’s beauty when it is not flowering. As garden plants they are always attractive, and they can be grown in many garden situations, as shrubs in different areas, including spots that are partially shady, or clipped into a hedge. These plants are naturally compact and rounded. They need no clipping to stay neat, indeed, too much clipping will reduce flowering, so they are extremely low-maintenance plants, with no pests or diseases. This makes them ideal for foundation planting around your home, in sun or partial shade, and having them close to windows means the fragrance will drift indoors, giving pleasure to everyone. Plant them in your beds, as permanent background shrubs for flowers, or use them to fill corners. They bring natural structure and visual interest wherever they are planted. Osmanthus Bushes also make excellent natural hedges. Their growth is dense enough and neat enough that they rarely, if ever, need clipping, and they will grow into a handsome, attractive, casual screen with no work needed. If you want a neater look, light trimming as they grow is better than a hard cut when they become overgrown. Heavy trimming can prevent flowering for several years, so leave them alone to express their natural beauty. Osmanthus are also great plants for containers. They can be grown for years and years in pots, and this is a traditional thing to do in China, where many of them come from. In a pot you can bring plants in flower close to the door, where everyone can enjoy the fragrance, and then move them out of the way while they grow for next year. With their evergreen foliage they are always attractive on a terrace or patio. There are several kinds of tea olives you can grow in your garden. They resemble each other in some ways, but each has a distinct look and personality, and they vary in the seasons when they flower. With several in your garden you can enjoy the delicious fragrance for months and months on end. Most Osmanthus Bushes grow steadily into small or medium-sized shrubs. Some grow perhaps 4 to 6 feet tall, other are 10 to 15 feet tall, while some, especially under ideal growing conditions, may reach 20 or even 30 feet in height, as small trees. Since they are best left unclipped, choose plants with final sizes that suit your garden and the locations you want to plant them. Large plants in small places is a common problem easily avoided with some planning. The leaves vary a lot between different ones, with some having spiny leaves like holly bushes, and other having smooth leaves with very few or no spines at all. 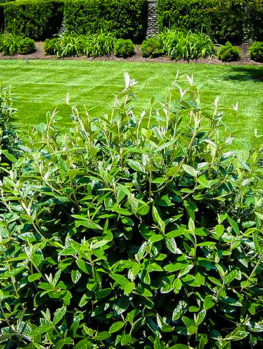 This is something to consider if you want to plant this shrub beside a walkway or within the reach of tiny fingers. The leaves are glossy, and the plant is evergreen, so it never looks bare. Mostly the leaves are about 2 inches long, or even more, but in some tea olives they are smaller, only around an inch long and a ½ inch wide. 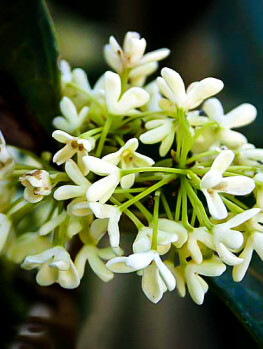 The flowers are usually white, although cream and even orange flowers are sometimes found on rarer varieties. They grow in clusters at the point where the leaves join the branches, and the whole bush is usually covered in blooms, making a very attractive sight. The individual flowers are small, just a ¼ inch across, but each cluster contain 5 to 10 flowers, so making a greater show. The level of perfume varies between different species, but always from beautiful to outstanding, so whichever ones you grow, you can be sure of a wonderful scent in your garden when your bushes are in bloom. Small berries may be produced after flowering, and these are purple-black in color. These plants are easy to grow, and they have no pests or diseases. They do benefit from some care and attention to the soil conditions, and they will reward you for that care by growing faster, more vigorously, and to a greater size than plants in poorer soils. This doesn’t mean they are difficult, and they will grow well in ordinary conditions with no problems. Once established they are even drought-resistant, so do not think you need to be an expert to grow such a lovely plant. Osmanthus Bushes grow in zones 7 to 9, so throughout warmer areas of the country they will grow well. Some can also be grown in zone 6 in sheltered places, and in that zone a good way to enjoy these plants is to grow them on a sunny wall. The warmth of the wall will give protection in colder times, and encourage flowering. Spread the branches out as they grow, and attach them to the wall. A series of wires running across the wall makes the attachment of new growth quick and easy. Some forms are a little hardier than others, and you should choose these if you live in colder areas. Tea olives thrive in full sun or partial shade. They can be grown in many parts of the garden, and they often grow best, and look most attractive, when grown with some afternoon shade. This is especially true for plants that have patterned or variegated leaves, as these can scorch in hot sun. All these plants grow well in most soils, but they perform best in well-drained, slightly acidic soils that are fertile, with plenty of organic material. Adding plenty of rich organic material when preparing the garden beds and planting your bushes is a good way to build richer soil for them, and adding mulch of organic material in spring will keep your soil that way. Just as you would for any new plant, keep your plants well-watered after you plant them. Water thoroughly once or twice a week for the first growing season, and as the plants grow do not let them become completely dry. Once they are well established, they will be drought-resistant, but they always benefit from a little care. This is a plant that will reward additional attention with watering and fertilizing by growing much more robustly and flowering even more profusely. The growth rate of Osmanthus Bushes is variable, depending on the type. 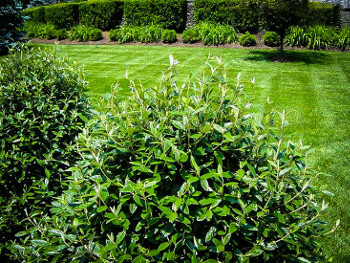 They usually grow between 6 and 12 inches a year, so in a few years you will have good-sized shrubs. Attention to feeding and watering will produce the fastest growth. This is easily dealt with, because these bushes normally have none. Any problems that may rarely develop are usually the result of poor growing conditions, so take care of your plants and they will almost certainly never have any problems. There are several different species of tea olives grown in gardens. Many of them originated in China or Japan, and in those countries they play a big part in society. The flowers are used to flavor tea and food, and they are often grown in pots outside homes. There is even an American tea olive, called Devilwood, Osmanthus americanus. This plant grows as a small tree through the Deep South and into Florida. It is rarely grown in gardens, because although the flowers are fragrant, they are small, and overall the plant is not as attractive as other species. From a gardening point of view, the biggest difference between the different types of Osmanthus is whether they flower in spring or fall. Below we have listed a few of the most popular fall-blooming varieties. This plant, Osmanthus fragrans, is, as the name suggests, the most sweetly-scented of what is already a very fragrant group of plants. It grows throughout southern China, Taiwan, southern Japan, and into Cambodia and Thailand. In China particularly, it is widely grown for the flowers, which are used to perfume tea, and in some places, soups, spirits and jams. It has cultural associations going back centuries, and it is linked to the traditional fall festival. This is the largest of the tea olives, and in ideal situations it can eventually reach 20 or 30 feet tall. More usually it develops into a shrub 10 to 12 feet tall. Not only is the perfume – rich with the fragrances of orange blossoms, Jasmin and peach – extraordinary, but plants bloom for at least 2 months, all fall, and even continue longer with some blooms opening in winter. In areas with shorter summers and colder falls, flowering may be delayed until spring. The leaves are not spiny, but they do have tiny teeth on the edges. There is a rarer form, called ‘forma aurantiacus’, which has orange flowers. This form is also more cold-resistant. The flowers do not last as long as white ones do. This is perhaps the most widely grown Osmanthus, and certainly the most diverse, with several attractive varieties. The leaves are edged in prickles, and the plant is often mistaken for holly. They are easy to tell apart, as this plant has its leaves in pairs along the stems, not alternating, as they do in holly bushes. It is also known as ‘holly olive’, and botanists call it Osmanthus heterophyllus, because of an unusual characteristic of the leaves. Young plants have a lot of prickles on the leaves, which protects them from grazing animals. As the bush grows taller, the leaves formed higher on the plant have very few, if any, prickles. ‘Heterophyllus’ means ‘mixed leaves’. The white flower clusters appear in fall, and they are richly fragrant. The false holly is the smallest of the tea olives, and some varieties only grow to about 4 feet tall. Most grow 6 to 10 feet tall and stay as dense, upright bushes. 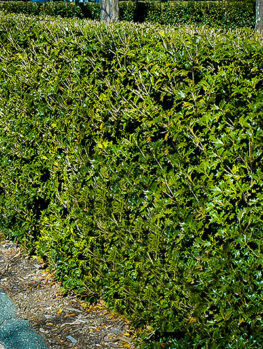 They also make excellent hedges, and are dense enough to rarely, if ever, need trimming. This means they will always flower well. This species has less conspicuous flowers than the Fragrant Tea Olive. There are a number of varieties of false holly, differing mostly because they have colored leaves of different kinds. These are often smaller than the wild tree, and make excellent colorful lower hedges. 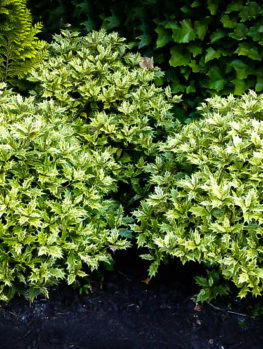 The variety ‘Goshiki False Holly‘ has leaves in many colors, with the new growth emerging pink, then developing into shades of mottled green, gray-green, cream and gold. The name means ‘five colors’ in Japanese, where this variety was developed. The patterning is seen best, and protected from sun scorch, by growing this plant in partial shade, sheltered from the hot afternoon sun. 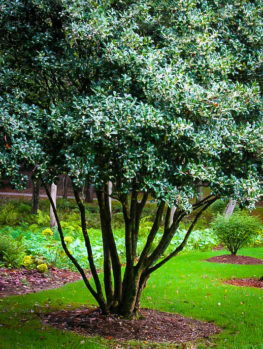 The Gulftide False Holly is a smaller, compact variety growing only 4 to 6 feet tall, with an upright form that spreads only about 3-feet wide. This makes it ideal for smaller gardens and narrower spaces. The foliage is very glossy, and very spiny, even on older plants. 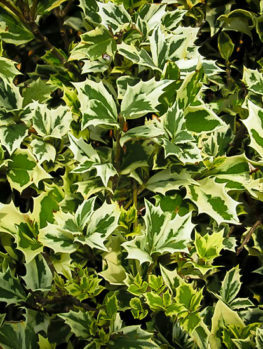 In this plant, called Variegated False Holly (or ‘Variegatus’), the leaves have a broad edge in creamy white. It can be grown in full sun without burning, and it grows slowly to make a dense, small shrub. Ogon – this variety has yellow-gold new leaves, fading to yellow-green. It is slow-growing and should be planted in partial shade to avoid scorching. Purpureus – the cultivar has dramatic purple/black young shoots and leaves, which gradually turn green. It is more cold-resistant than other varieties. Sasaba – this tight, upright form has twisted and extremely spiny leaves and grows giving it an interesting texture, but handle it carefully. Below we have listed all of the most popular Osmanthus Bushes that bloom in spring, along with more information on each variety. Keep in mind that by planting one or two of both spring and fall blooming plants in your garden, you can enjoy the delicious perfume for months and months. The Fortune’s Tea Olive is a hybrid plant that was introduced from Japan in 1862 by the famed plant collector Robert Fortune. It is a hybrid between the fragrant tea olive and the false holly. It blooms in spring, and can grow to 15 or 20 feet tall. The leaves have small spines. This Chinese species, Osmanthus delavayi, blooms profusely in April. It has a more open and arching form than other tea olives, and can grow 6 to 10 feet tall and wide. The leaves are small, just an inch or so long, shiny, dark-green and with toothed edges. Another Chinese species, Osmanthus decorus, is rarely seen, but has large smooth leaves and white spring flowers. The fruits are larger than in other species, looking like miniature plums. This is a hybrid between O. decorus and O. delavayi, created in England in 1930. The large leaves have toothed margins, and the flowers appear in spring.